Jesus De La Rosa, associate professor of art at Texas A&M University-Kingsville, currently has a print on display in the New Prints 2017/Winter exhibit at the International Print Center New York. De La Rosa’s work was one of 50 pieces chosen by a juried panel from over 2,000 prints. The exhibit will be on display until Saturday, March 25. 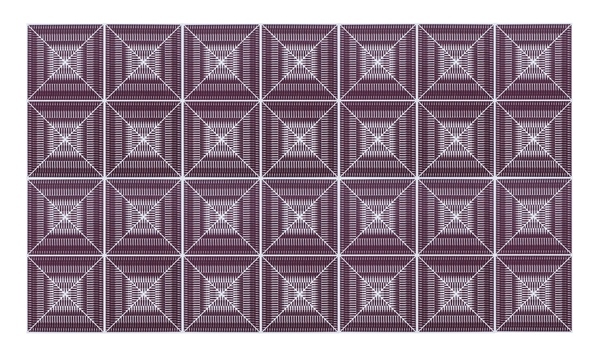 The exhibit will feature De La Rosa’s print entitled Daily Pattern, a 30” by 58” installation of silkscreen on sintra. The New Print program is a series of juried exhibitions organized by the International Print Center New York twice a year featuring prints made in the past 12 months. “Sometimes, a river or a mountain range will determine the boundary between peoples. Every so often, this borderline is the only link of a line drawn by a man,” De La Rosa said. “My early life was devoted to daily traveling across the U.S./Mexico border, ensuing from my parents working in Mexico and living in Texas. “The substance of the artwork I produce derives from my insight of the Texas/Mexico landscape, where cultures, languages and identities constantly conflict and bind,” he said in his artist statement. De La Rosa received his bachelor’s degree in fine arts from Texas A&M-Kingsville and his master’s degree in fine arts in studio art from The Ohio State University at Columbus, where he was awarded a Graduate Enrichment Fellowship. As an associate professor, he teaches beginning and advanced courses in printmaking and graphic design. His art work has been reviewed and featured by Voices of Art magazine, The Monitor, The Brownsville Herald, Corpus Christi Caller-Times, San Antonio Current, Mexican newspapers El Mañana, La Frontera, La Prensa and Voices of Mexico magazine in Mexico City. De La Rosa exhibits his artwork throughout the United States and abroad in solo, juried and invitational exhibitions. His work was selected to be part of the 12th Annual Young Latino Artist Exhibition at the Mexic-Arte Museum and Emma S. Barrientos Mexican American Culture Center in Austin. His book, Borderlands, was selected to be part of the international touring exhibition Monumental Ideas in Miniature Books II, which will tour eight international venues and over 40 national galleries. Most recently, he was Visiting Artist at the Lawrence Arts Center in Lawrence, Kansas.